During my first few minutes using Scrivener 2, I kept thinking the most apt comparison was “word processor on steroids.” But that’s not quite accurate. For one, there are no negative side effects here—save for the commitment the user will have to put in to learn a flexible, layered, and impressive program. And Scrivener is about as far from a word processor as LeBron James is now from Miami. Enter Scrivener: a word processor and project management tool that stays with you from that first, unformed idea all the way through to the final draft. Outline and structure your ideas, take notes, view research alongside your writing and compose the constituent pieces of your text in isolation or in context. Scrivener won’t tell you how to write—it just makes all the tools you have scattered around your desk available in one application, leaving you free to focus on the words. There are also tutorial videos here. A lot of them. I’ll admit to being somewhat overwhelmed at first. Scrivener is, after all, the kind of program you need to spend at least a little time to learn how to use, even if you’re already relatively computer-savvy. But it promises to be time well spent. As an experiment, I decided to watch the ten-minute overview (the first video at the link above, “An Introduction to Scrivener”) to see if it was enough to get me “up and running as quickly as possible,” as the video description suggested. I had never used Scrivener before this month. Sure enough—10 minutes later (plus another 30 minutes or so searching the forums, help files, and user manual) I was up and running, using Scrivener for the first time to complete a grad school writing assignment. The paper I was writing requires multiple sections and is a topic I’d written about before. I also had some readings to integrate into the paper. And, of course, I wanted to keep the syllabus and specific requirements in front of me as I wrote. The leftmost column is the Binder. This looks a bit like a Mac’s Finder folders. Here is where I laid out my paper. The preset template took care of the “Title Page” and “Works Cited” formatting; I just had to fill them in. I outlined the “Main Content.” Underneath that is “Research,” a set of .pdfs and other files I dragged in. Instead of switching between Preview, Word, and multiple windows in multiple programs, I could access everything I needed from the “Binder,” once I put it there. This meant that once I took a few minutes to set up the project, I only needed this one app open to complete the writing assignment, start to finish. The “Ideas” section in the Binder, by the way, allows you to do a virtual version of creating notecards, for later rearrangement and integration into the paper. The middle panes (the largest ones) comprise the Editor, which is where I wrote the paper. One really cool thing about this is you can have it all be one big pane, or you can open two panes at once. 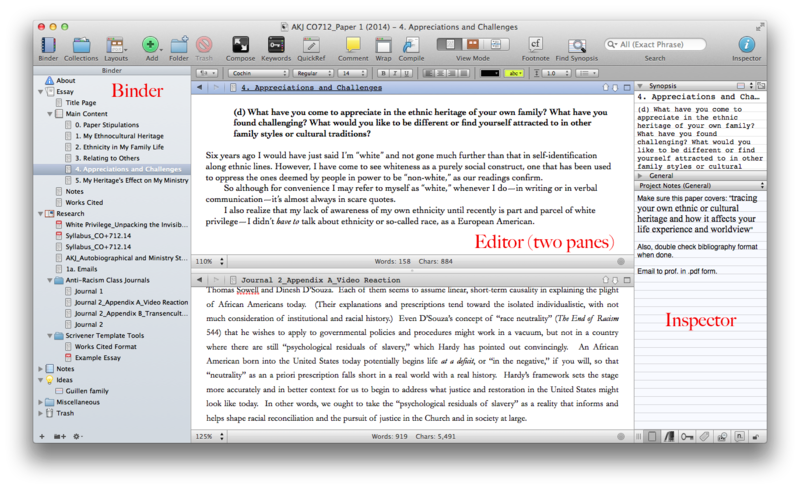 In the above screenshot, I’m writing my paper in the top editor pane and accessing a previous writing for reference in the bottom pane. At right is the Inspector. This is versatile and can be used to select one of six different sub-panes. In the view above I have open a short synopsis of the section I’m writing (here I copied from the assignment so I knew what I was supposed to be writing), as well as some general Project Notes I wanted to keep before me for each section of the paper. After I had written the paper, I selected Compile from the File menu, and Scrivener gave me a myriad of easy-to-navigate options for how I wanted to export my paper into a word processor for final formatting. I exported it to Word and only had to do a very few tweaks to have my paper come out properly formatted–including the footnotes. Literature & Latte kindly supplied me with a license of Scrivener for the purposes of review. There is much, much more to the program than what I have outlined above, and I’ll write more later. I came to Scrivener this week just wondering if I could learn its basics fast enough to use it right away to write a paper, and in a way that would save me time compared to my normal workflow. This was very much the case when I had finished. I only wish I had known about the program much sooner in my graduate studies! Want to check it out? (I recommend it.) Here you can download a free trial, for Mac or Windows. (It’s a generous trial period, too.) 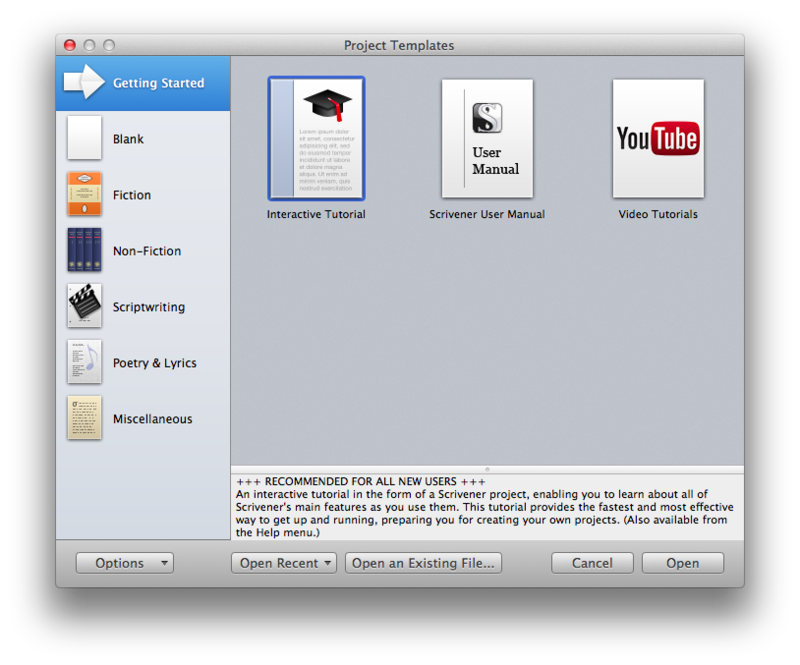 You can read more about Scrivener’s features here. Great review….one thing to think about: let’s say your advisor would like to make track changes in Word and then you want to accept some of those changes and keep writing. How is the import/export feature? That’s a great question. I’ve just been using Scrivener for two weeks, so haven’t done a lot of import/export yet, but I’ll check it out and see what I find. This doesn’t answer your question directly, but there is a nice “Snapshot” feature where you can compare previous drafts to your current one in Scrivener, all in one view. I’ve also emailed someone at Scrivener to ask and will let you know what I hear back. I haven’t been able to figure out yet a way to do what you’re asking (i.e., import the track changes as such). But there might be workarounds. I suppose you could just import the Word document to Scrivener, once you had accepted any changes from Word, and then work from that. Does it handle right-to-left text on a Mac? Hi there–I suppose it depends on what you want to do, whether it’s your own input of RTL text using a Hebrew keyboard, import from a previous document, copy-paste, export, etc. I haven’t used Scrivener for a large multitude of tasks yet. I was, however, able to successfully copy-paste a paragraph (with Hebrew, English, and Greek) from Accordance into Scrivener, and then cleanly export to both .pdf and .rtf formats with everything properly preserved.